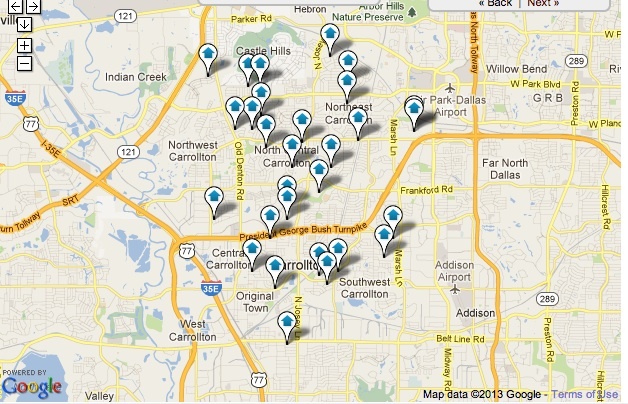 Using our websites innovative home search tool will provide you with all the newest information regarding Carrollton homes for sale. The city of Carrollton is located in the heart of the Dallas-Fort Worth area. Its location offers residents and businesses, direct access to a large labor market, top colleges and tourist attractions. Residents are drawn to Carrollton for its high quality of life, abundant parks, affordable housing, schools and safe neighborhoods. In 2008, MONEY Magazine ranked Carrollton 15th in the country as the Best Place to Live and Forbes Magazine recently ranked Carrollton #12 for "America's Best Places to Move." The city of Carrollton is served by The Carrollton/Farmers Branch Independent School District (CFBISD), Lewisville Independent School District (LISD), Dallas Independent School District (DISD) and Plano Independent School District (PISD). The majority of Carrollton's school age residents attend schools within the Carrollton/Farmers Branch Independent School District or the Lewisville Independent School District. Contact an experienced Carrollton REALTOR at The Todd Tramonte Home Selling Team can assist you in your Carrollton home search.